Ally ~ “When the The High Lady Of Love and Compassion chooses to be your Ally, she brings you a deep and meaningful message, she reminds you that only Love is real. It is the sole unconditional and true power behind all means of manifesting out of the unseen into the material. Love’s greatest creative power is ignited by the conscious action of compassion. Generosity of the heart, reverence, respect and empathy for all living things bring you profound power to live a life of happiness and contentment. Love, compassion and kindness to all must be the impulse behind your thoughts, feelings and actions when your intention is to create a prosperous and abundant life. Unconditional Love will be returned tenfold. 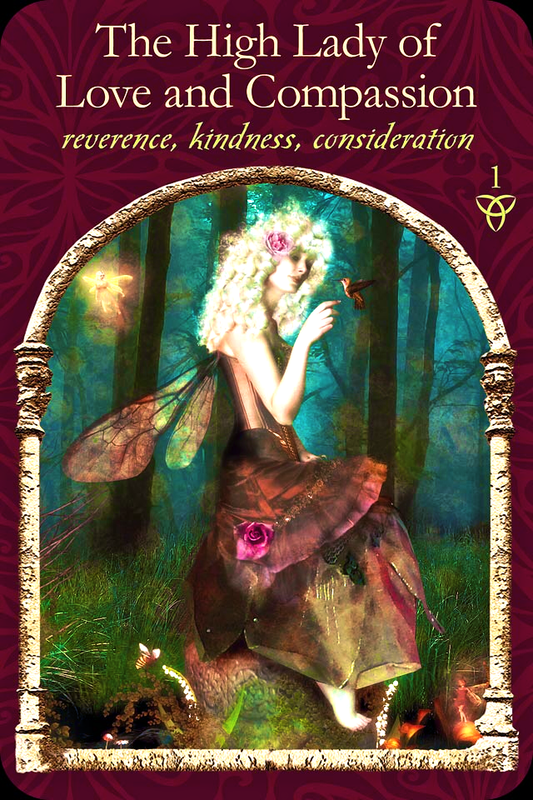 The High Lady Of Love and Compassion also reminds you that when she chooses to be your Ally, she brings you evidence that you are loved. All manner of synchronicities align in your favour. The opposite of fear is love. When we apply Unconditional Love to any person or situation that we are facing, we can see things in a new light. The light of love. Unconditional Love is complete and total acceptance, no judgement. It is the acknowledgment of the lessons to be learned in this physical realm. It is the acknowledgement of Spirit, Source and the Soul. When we can find it in ourselves to send love no matter what, we release the ties that bind us to a limited space in this reality. With love we can finally liberate ourselves from fear, doubt and worry; embracing peace at last. Unconditional Love starts from the inside. We are so often our own worst enemies. We think that we don’t deserve to be happy until we are perfect: physically perfect; financially perfect. The perfect body; the perfect career; the perfect house; the perfect car. We get wrapped up in the material as if it is an expression of our Soul. We forget that we, here on Earth, are a thimble full of our true selves, that we are so much more than this. When we accept that wherever we may be in our journey is where we are supposed to be, that we are the creators of this reality, that we are doing the best that we know how, we free ourselves to love. Love ourselves Unconditionally, and then, radiate out that love to others. Decide today to remove yourself from the drama and practice compassion and Unconditional Love… all day long. These are skills in this day and age; we must practice them to shift our perception until they become ingrained. We have been raised to believe that there isn’t enough; that someone else might take something away from us; that others deserve more than we do; that the world is scary and unfair. Let it all go, for today. Inhale and exhale deeply of the Love available to you now. Universal Love. Source Love. Spiritual Love. Divine Love. Soul Love. Feel it in the heartbeat of Mother Gaia as you place your hands on the ground. Feel it in the trees. See it in the sky; the sun, the clouds, the stars, the Moon reflected back at you. Know that you are a part of it all. Send love and receive love back again. As above, so below. Your card post is really defining my journey. It’s truly a blessing of guidance to me . God bless you and your loved ones. Grateful to you once again . Thanks. Big love! Do keep guiding me further.